Alcohol Ban, Friday Prayers: Is Bosnia Going Muslim? The authorities of the Sarajevo Canton announced in December that there would be no alcohol served during an open-air New Year party in the capital of Bosnia and Herzegovina to usher in 2017. The surprise decision to ban the sale of hard drinks in a country which, according to the World Health Organization’s Global Status Report on Alcohol and Health, was Europe’s hardest drinking country as recently as in 2011, raised fears that Sarajevo was on the way to become a place where Sharia law rules supreme. A ban on the sale of alcohol, mass-scale sale of land to Arabs, street signs in Arabic and a national census, according to which Bosnia and Herzegovina is a predominantly Muslim country – all this is sending a “very bad signal” to foreign tourists coming to Sarajevo, especially during holidays, Sarajevo-based expert on religion, Mehmedalija Nuhic, said. “All these foreigners are going to feel is that they find themselves in a religious, anti-secular country,” Nuhic noted. Recently there have been strong attempts to present Bosnia as a Muslim-majority country. According to a 2013 census, Muslims account for just over 50 percent of the country’s population. However, because the organizers also counted in Bosnian Muslims who have long been living and working abroad, the Bosnian Serb Republic refused to recognize its results. 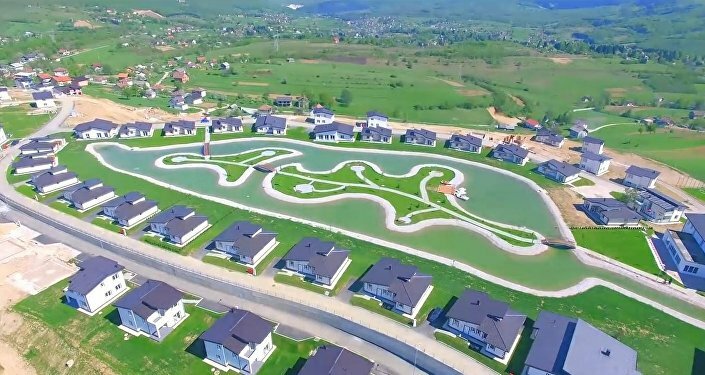 In another sign of Bosnia, once a symbol of “multiculturalism,” now turning into a Muslim country, Arabs are busily snapping up local real estate, mainly in close vicinity to Sarajevo, abandoned by its ethnic Serb owners during and after the 1990s war. In Ilidfza, a Sarajevo neighborhood, which is now home to a large Arab community, locals say that Arabic is now a second language there with almost everything, from apartment sale ads to kebob price tags, written in Arabic. Getting around local property laws, the Arab newcomers are setting up firms to buy land and real estate. Just how much real estate in Bosnia is now owned by Arabs and how exactly it changed hands, is anyone’s guess. In a recent interview with N1 television channel, Sarajevo University Professor Esad Durakovic said that thousands of hectares of prime Bosnian land were being sold to the Arabs. “We are witnessing the implementation of an international project of the ‘Muslimization’ of Bosnia and Herzegovina,” he warned. In December, the University of Sarajevo announced that it will not hold classes during Muslim Friday prayers in what many see as another step towards the Islamization of the country. Three left-wing and liberal political parties including the Social Democratic Party (SDP) denounced the move amid widespread fears of radicalization among the country’s Muslims. Meanwhile, the first all-Arab village has appeared in Bosnia and Herzegovina. Each house in this new development is owned by Arabs. During the summer season, Bosnians and Serbs are not even admitted, according to the Bosnian portal biznisinfo. Bosnia's first "closed" village is fenced off with a high wall and guarded by private security services. It is located in the municipality of Hadžići near Sarajevo. There are about 160 homes and an artificial pond currently built in this peculiar settlement.